One sure sign of spring, along with the emerging grass, the puddles and dirty snowdrifts, seems to be the abundance of potholes! Whatever shall we make of that? I’d love to wax poetic about the returning of the geese, the twittering of the little birds in the little shrubs round about. I see the swelling buds on the trees, the golden haze appearing on the patches of willow. Flocks of birds are gathering in the hedgerows at the bottom of my garden—the cardinals, the chickadees, the sparrows, all with that unmistakable spring-time bustling and chirping signaling the season. I’m missing the familiar first eruptions of green buds I know are emerging in the garden I left behind last autumn. I wonder how my forsythia is doing. But soon we’ll be seeing what the new garden has to offer. And we’ll be putting our stamp on it before too, too long. Even the prospects of that new garden are fun and hopeful. But what of all these potholes? There really is water running everywhere. All those big piles of dirty snow get noticeably smaller every day, virtually every hour. Stand still, somewhere outside, anywhere and you can hear water running, snow melting, ice becoming water. Driving through open countryside the other day I noted broad stretches of water. Fields that someday, not too far off, will need to be planted, are just now great flooded expanses. All that water is going to go somewhere. It’s going to sink into the ground, run into the water table, find its way via drain, ditch, creek, stream, to the nearest river. Some of it is going to travel under the asphalt. It’s going to freeze and melt a few more times and when it does, it’s going to create potholes. Advising, ever so gently from the passenger seat, the new young driver dealing for the first time with the ridiculous succession of potholes in a back country road in rural Quebec, I found myself offering up my familiar Lenten message. 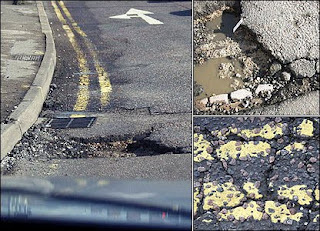 Who knew that the coincidence of potholes with Lent was another of those interesting happenstances? If you’re on the road today, watch out for the potholes. They are inevitable. But if you slow down you have a better chance of a positive outcome.